Yes, I was born on Halloween day. 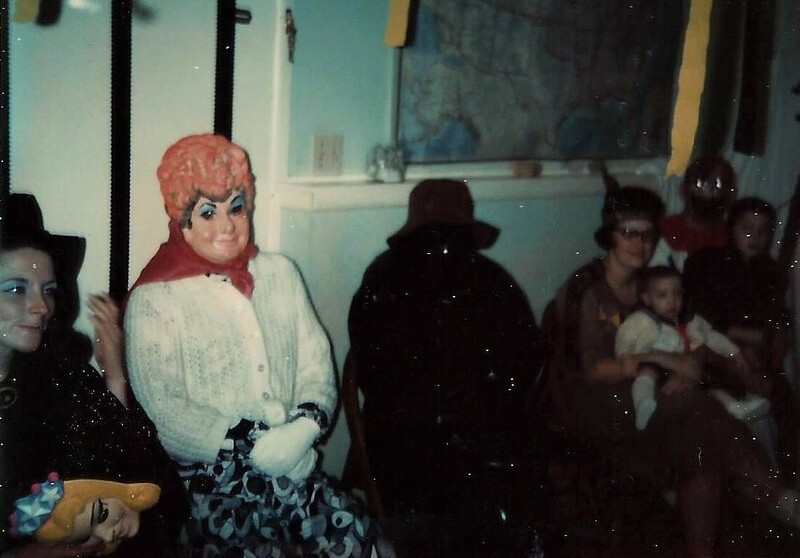 When I was a little girl I dressed up like a witch every year for trick or treating! How could I be anything else? While my siblings were fidgeting, wondering how they should dress up, I was quietly making my tall, pointed, black hat, finishing off my costume of all black clothes, and Mother’s broom! The only problem with having my birthday on Halloween, as I saw it, was that my siblings didn’t care about a birthday, they only wanted to go trick or treating! And that’s all I wanted to do too. I don’t remember ever having a birthday party. But we sure had fun and we got lots of candy! Then I grew up and got married. 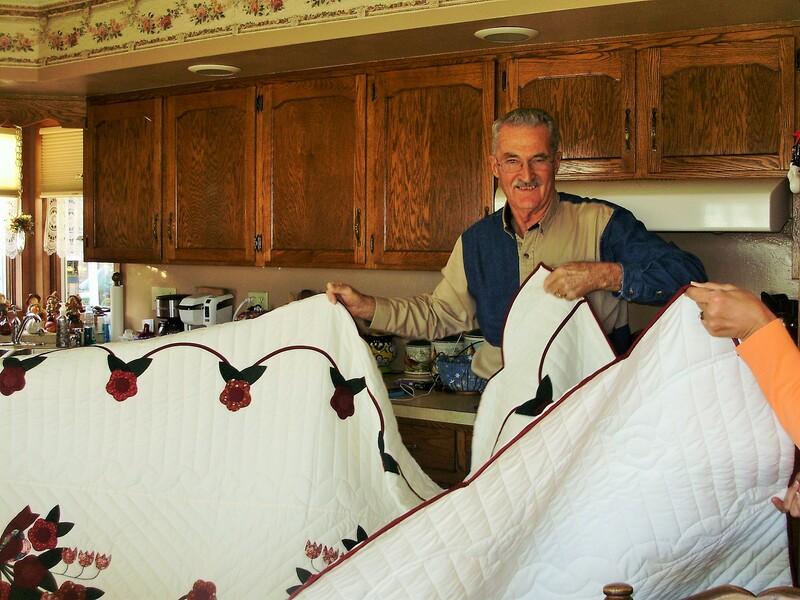 At that time, in Jerry’s family, a party was held for each one on their birthday. So for my birthday, I made a birthday cake, and everyone came over from the oldest- Grandma, to the youngest- baby, Marilyn. The thing I remember most about that party was that my cake wasn’t big enough! So the years have gone by. Our family grew and our kids loved to go trick or treating. I remember one year, 1970, we had a Halloween party and invited our neighbors and friends. It was a lot of fun. Everyone, including parents, wore Halloween costumes. We played all the common Halloween games: bobbing for apples, counting the pumpkin seeds. 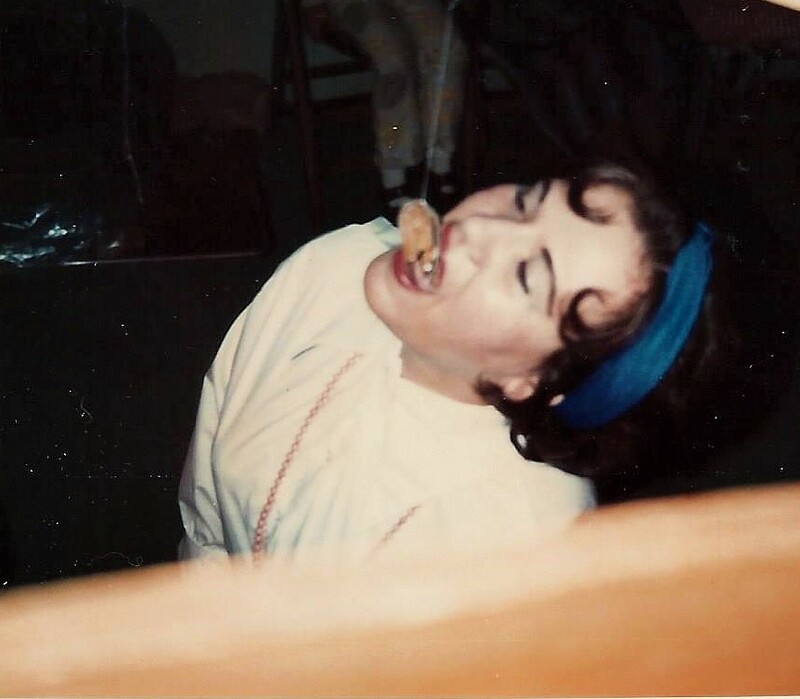 In this picture, Carolee is trying to eat a donut hanging from a string! We even had a small ghost house! I can’t remember all the games we played, but it sure was fun! One of the mothers, knowing it was my birthday, baked a birthday cake for me! Surprise!!! It was decorated like a jack-o-lantern! I’ve continued to have birthdays and Halloween has also continued. We live in a woods with a long driveway today so we don’t even get any trick or treater’s. Jerry always takes me out for my birthday supper. Three years ago I had an unforgettable birthday! I turned 74! 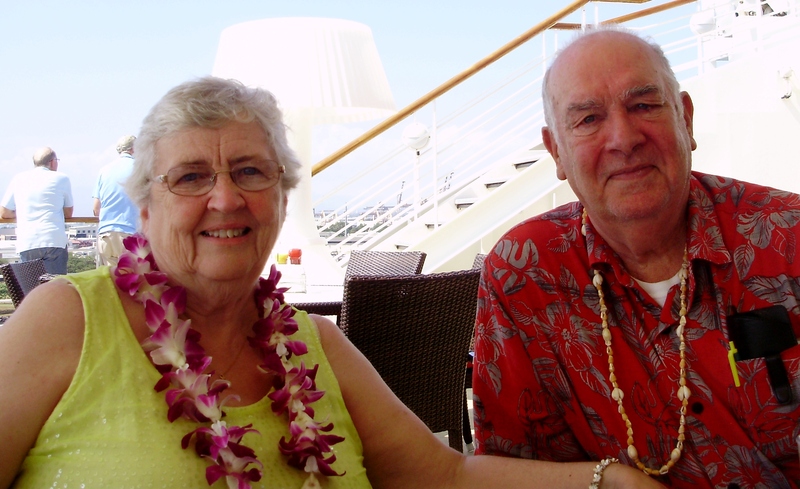 Yes, it was Halloween, but we were on the Norwegian cruise ship, Pride of America, cruising the Hawaiian Islands! What a special birthday! Jerry and I were with Pam and Gene, daughter and son-in-law. They celebrated their anniversary! Kay, second cousin, was, also, with us. What a fantastic time we had! Two years ago, I had another fantastic birthday! I turned 75 and we went to Iowa to visit my Iowa cousins! It wasn’t a birthday trip. It just turned out to be the best weekend for all of us concerned! Tim, our Canadian son, came down to visit us. We traveled to Chicago where Pam and Gene, daughter and son-in-law, joined us and we all traveled to Iowa to visit our cousins. It happened to be on my birthday. I had requested to, please, keep still about it being my birthday. Well, the first thing that took place was Leroy, my most favorite cousin in the whole wide world, bringing out a huge cloth bag and handing it to me, with a huge smile on his face! I looked at Jerry and Pam. They both looked as surprised as I did! I slowly opened the bag and inside was a BEAUTIFUL AMISH QUILT! Leroy! Carolyn! 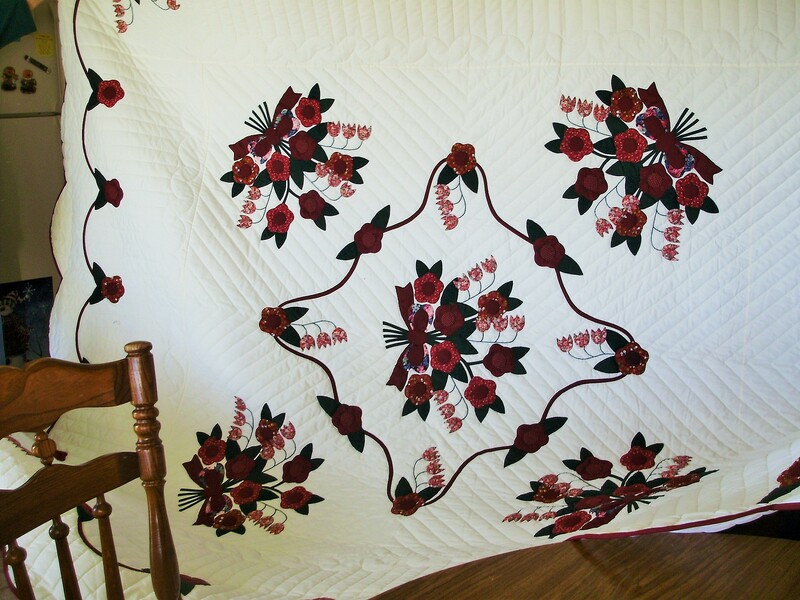 Rose of Sharon quilt, hand-stitched by Amish ladies! Carolyn said she knew it was my birthday because of facebook! Well, that wasn’t the end of my birthday! 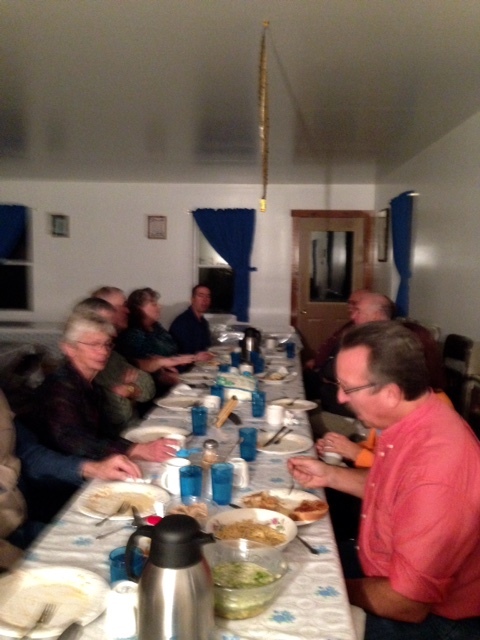 That evening we went to an Amish dinner! Oh, my! Other cousins joined us! The only lights were kerosene lamps. 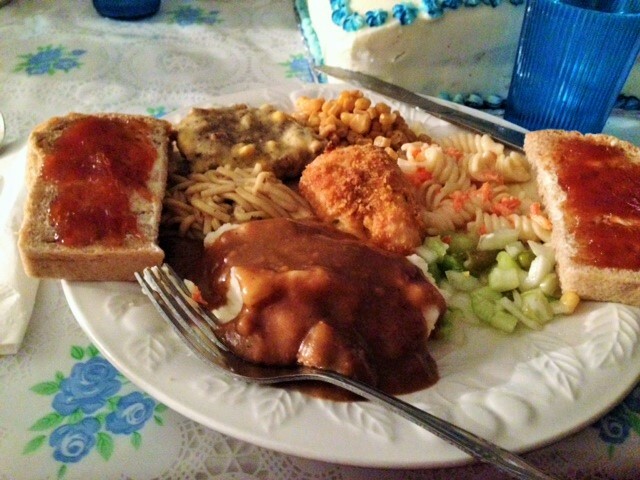 My birthday dinner plate! Everything was so delicious! 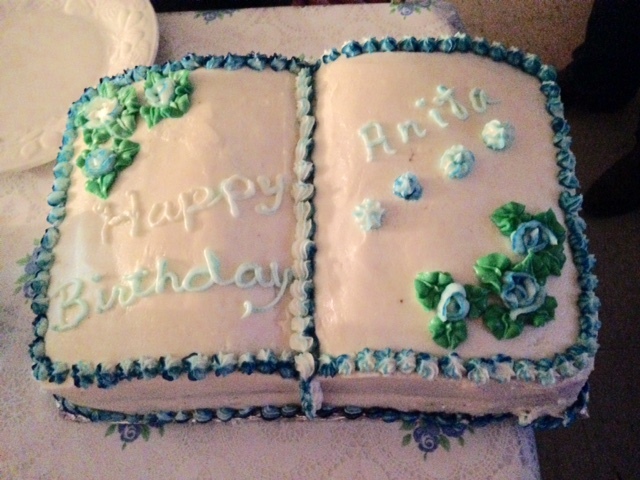 My beautiful birthday cake made by one of the Amish ladies! So, today I’m planning on a normal Halloween birthday! Jerry will take me out for dinner. I’ve already gotten some phone calls from some of our kids. The mailman must have chuckled when he delivered my birthday cards today! They were addressed to Grandma in various ways! So begins another year in the life of me! I don’t feel 77! I don’t think I look 77! I know I don’t act 77! I am blessed! This entry was posted in Birthday, Cake, Carolyn, Chicago, Children, Cousins, Cruise, Daughter, Family, Hawaii, Iowa, Jerry, Kay, LeRoy, Me, Memories, Pam, Reminiscing, Tim, Travel and tagged Aging, Birthday, Cousins, Cruise, Family, Fun, Gene, Halloween, Hawaii, Iowa, Jerrry, Me, Memories, Pam, Tim, Travel. Bookmark the permalink. Your hard-to-deal with birth date has evolved into something spectacular here. 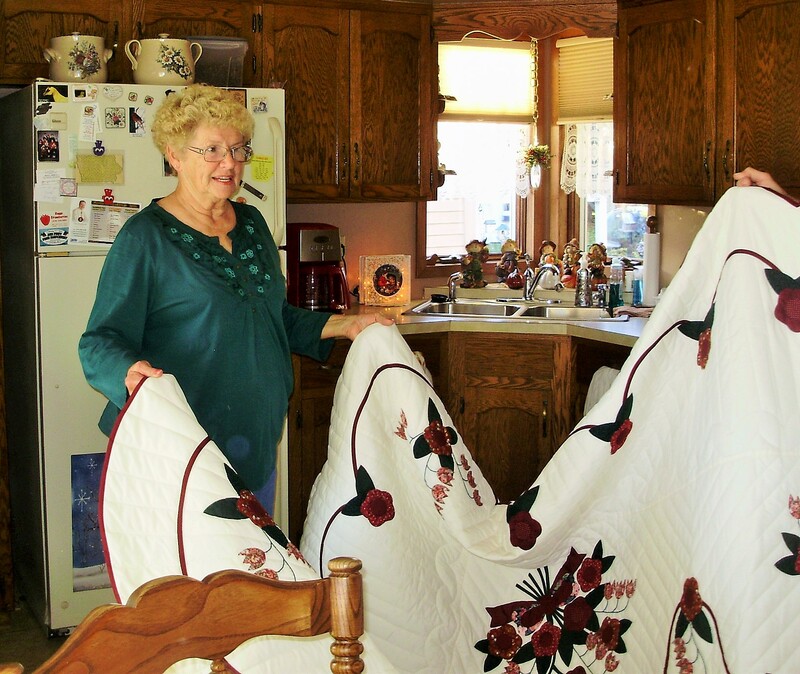 Of course, the Amish quilt gift + an authentic Amish dinner especially piqued my interest.